I want this phonograph, and I don’t even own any records. The Braun Phonosuper sk4 is a product of German postwar “geometric formalism.” Geometric formalism describes the school of design that governed the aesthetic and interfaces of Braun’s products for years under Dieter Rams’ direction. The straightforward layout of the controls and simple form language serve to bolster manufacturability and visual legibility. A product’s visual and tactile details should tell a story about its use. Rams’ phonograph looks simple, but his adherence to geometric simplicity and minimalism allows him to control what the product tells people about itself. Its simple and boxy structure might not speak to the music it produces, but rather to the environment it lives in. Consciously or not, everyone approaches a new gadget or appliance with the following questions. They might try to answer these questions mentally before trying it out, or as they go through the process of figuring it out. What do each of your controls do? In what order to I need to operate your controls to make you work? Should I be gentle or particular with how I operate these controls? We can look at a dinner party place setting the same way.... There are six utensils and four glasses to arrange for the diner. The order of these items on the table corresponds to the sequence of the courses, so that the diner only needs to take the outer most desired utensil during each course. 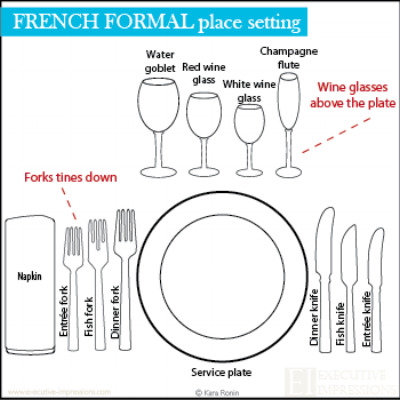 Similarly, the champagne flute is the farthest to the right because it would be used for a toast at the beginning of the meal, and then cleared. Without this system, diners would not be able to use the proper silverware, making extra work for the help. Within the world of electronic and mechanical products though, there is much more potential to make understanding from a two-way conversation. The designers can introduce details that give the user active feedback, such as an illuminating ON button when the button is depressed. Passive feedback plays an equal or greater part, especially in a product that is as hands on as a phonograph or radio. Visually, the purposeful and minimal approach affords big opportunities to grab the user’s attention. Naturally, there may be a sparing use of color or visual mystique aside from the start point or end point of the interface. Coming back to the place setting example, the same logic used there dictates how designers lead a user through any experience. The bright red button draws the eye in immediately. From there, even just by feel, the hand moves to the largest knobs. It doesn’t matter which the user chooses first (volume or tuning), because their functions become self-evident by simply adjusting them. The feel of the knobs punctuates this information, as the volume knob is smooth and linear, whereas the tuner is precise and notched.